Surgeons in Argentina were able to complete an operation using the light from cellphone screens after a city-wide blackout. 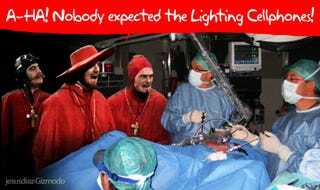 The hospital's generator failed to kick in and they continued to work in darkness until someone stepped into the room—not the Spanish Inquisition but, nevertheless, someone completely unexpected. Local man Leonardo Molina was on the operating table undergoing an appendectomy when the lights went out in the town of Villa Mercedes' Policlinico Juan D. Peron. A relative, thought to be the 29-year-old patient's elder brother Ricardo, collected up mobiles from other patients' families who were waiting in the hallway, and took them into the theater.